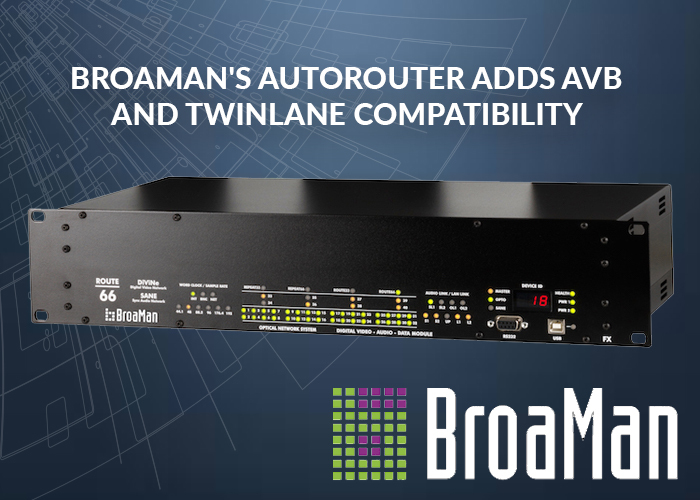 The popularity of BroaMan’s Route66 AutoRouter with Optocore® technology has continued apace since the streamlined version of associated company BroaMan’s Route66 first debuted on the Coldplay tour. Since then the Route66 AutoRouter has featured in a slew of high profile installations, including the Westfield Centre in London, Europe’s largest shopping mall, and Luzhniki Stadium in Moscow, redeveloped for the FIFA World Cup. The attraction of the device is that it offers Auto Routing and an intelligent fibre patch bay (replacing the traditional patchbay)—this functionality powered by Optocore—making it ideal for installations with multiple connection points and mobile stage boxes as well as live events and broadcast. Initially compatible with stand-alone Optocore networks and DiGiCo fibre loops, BroaMan has announced that the same functionality is now available for Yamaha TWINLANe cards, which support single-and multi-mode optical fibre, and AVID AVB network cards, allowing smarter theatre sound systems to be designed using their flagship consoles. So how will this benefit the system designer? Essentially, what Route66 AutoRouter does is create a redundant star out of ring topology and closes the loop automatically between active devices and mobile stageboxes. There is no longer the need to patch cables manually, as the system is always redundant. Route66 will function as an intelligent patchbay, automatically detecting active devices and forming a loop topology from them to establish redundancy, without any user interaction. This speeds up system layout and configuration for any production. The device can be equipped with up to 40 duplex LC sockets allowing up to 20 different connections from different locations, devices or device groups. Vennligst registrer deg her hvis du ønsker å motta vårt nyhetsbrev. Danmon Group Norway A/S er den del av Dan Technologies A/S, et internasjonalt konsert med hovedkontor i København og med selskaper og aktiviteter i Danmark, Sverige, Norge, England, Tyskland, Spania, Portugal, Dubai og Vietnam.